Glenfiddich has launched The Cask Collection, three new whiskies comprising of Glenfiddich Select Cask, Glenfiddich Reserve Cask and Glenfiddich Vintage Cask. 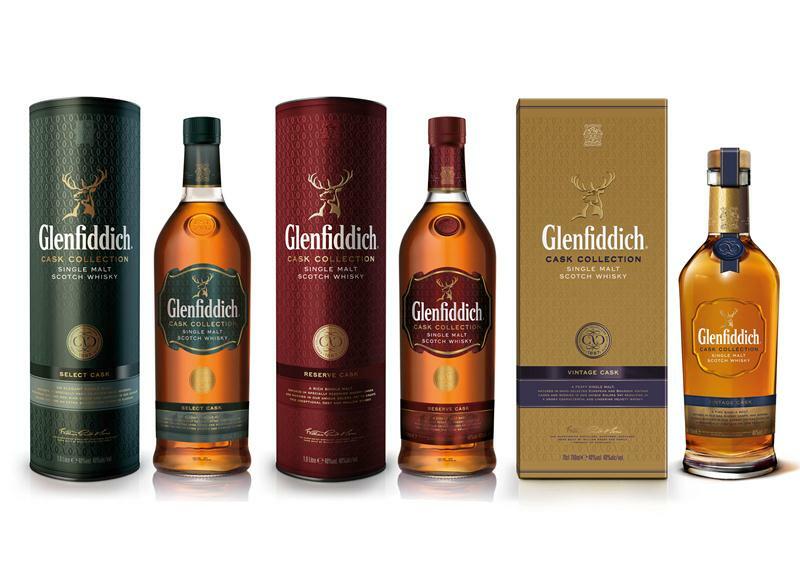 These are Glenfiddich’s first no-age-statement range of single malts and have been released into the global travel retail market; a range the company is calling its “most innovative launch of the year”. The trio will become the core range representing Glenfiddich in travel retail, and will replace 12yo, 15yo Solera and Rich Oak on travel retail shelves. The characteristics of each whisky are the result of maturation in a variety of oak casks, followed by a finish in one of three newly installed and specially created Cask Collection Solera vats. Glenfiddich Select Cask is said to contain “layers of sweetness, spice and hints of citrus, matured in hand-selected aged Bourbon, European oak and red wine casks to impart a beautifully soft taste”. 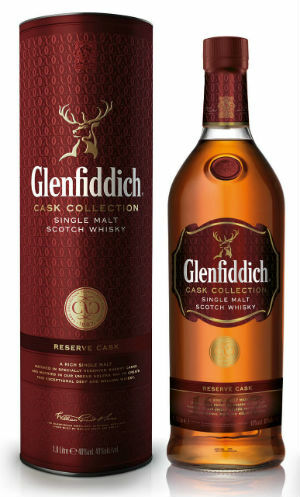 Glenfiddich Reserve Cask is matured in Spanish sherry casks used for their mellow and rich flavour characteristics. The whisky is said to be “sweet and spicy, with a complex flavour that evolves in the glass”. 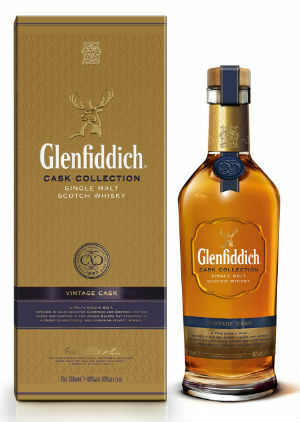 Glenfiddich Vintage Cask is matured in European oak and American bourbon casks to impart a smoky, peaty taste. It is inspired by the first Glenfiddich spirit in 1887, when barley was traditionally malted in kilns at the distillery over furnaces fuelled with dried local peat, infusing the whisky with smokiness. 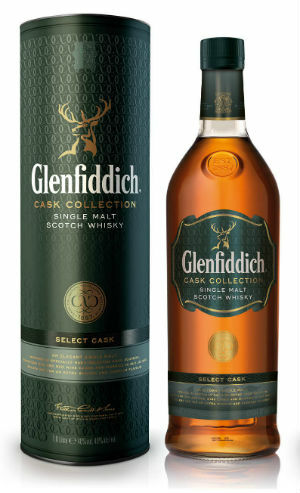 Glenfiddich Select Cask and Glenfiddich Reserve Cask are presented in Glenfiddich’s one-litre triangular bottle. 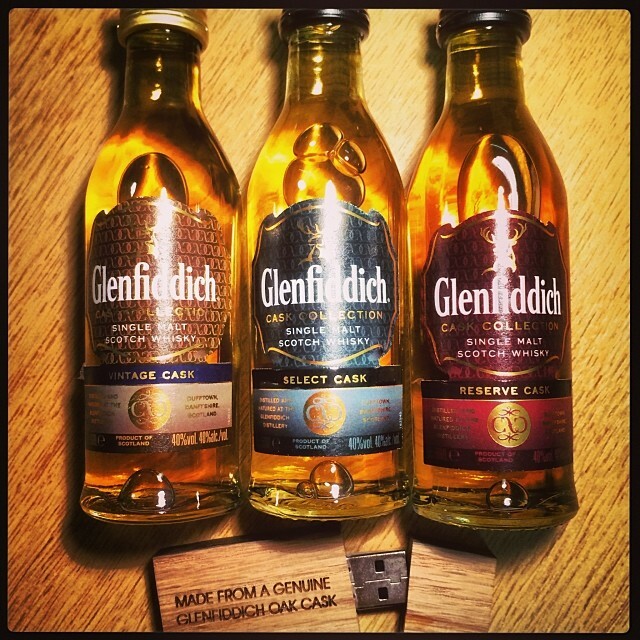 Glenfiddich Vintage Cask is available in a 70cl bottle, packaged in a presentation box. Nose: Sweet and malty with plenty of American oak vanilla and bourbon goodness. Pretty much what you’d expect from Glenfiddich. Palate: The palate is very much similar to what your nose finds, it’s rich, malty and sweet. Quite light, summery fruits and some light oak. Finish: Fairly fresh with eucalyptus. Sweetly mouth-watering. Fairly short but flavourful. Thoughts: Considering it’s bottom of the range it’s already setting the bar quite high with quality. It’s light and very drinkable, summary. What you’d call a good session whisky. If it were not chill-filtered it’d be pretty awesome, although probably quite a bit more money. 83. Colour: Rich golden with slight red hues. Nose: Laid back, subtle, gentle and fantastic. It’s sweet and malty with light late summer fruits meeting you along with small hints of vanilla custard. Spirity notes after a while in air. Palate: Again the palate closely matches the nose. There’s a sweet, slightly fizziness that greets you along with both green and a handful of red apples and gentle late summer berries. Although it’s only 40% it does have a certain thickness to it. Finish: Still slightly fizzy which is really delightful. A longer finish with the richer sherry fruits becoming more apparent. Thoughts: For me this is worth the extra £10, it’s relaxed and easy going with a bit of depth. 86+. Colour: Deep yellow to gold. Nose: Hummm, peat. More of a costal peat than expected for Speyside which usually isn’t that salty. There’s malt, and a touch of sweetness, but more peat smoke than I had imagined there would be, good stuff. Palate: Not overly thick and not quite as up front with the peat as you’d expect from the nose. It’s gentle and the wafts of peat smoke grow slowly in waves complementing the sweet malty summery nature of the Glenfiddich that’s in the glass. Finish: Fairly light, tasty and sweet and then the peat smoke kicks in and goes on and on, it’s really yummy. Thoughts: There’s a lot of great peated whisky out there, only you will know if you’ll pay £80 for this over something else. However if you love Glenfiddich and love peated whiskies and fancy trying something that’s new then this is the perfect combo and exactly what you’d hope for. 88. If this was not chill-filtered it’d be thicker and even tastier. If that was the case it’d really be quite something. Thanks to Grants for the samples! Watch out for these on your travels in airport duty frees. This entry was posted in News, PR, Review, Whisky and tagged Glenfiddich. Bookmark the permalink.